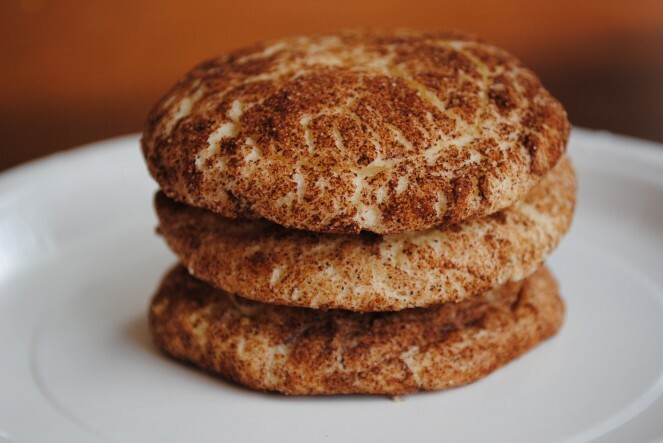 These cookies are crisp on the outside and cakey in the middle and a wonderful bundle of cinnamony-sugar goodness. They didn’t last long in our house and I’m going to guess they won’t in yours either. I think this month of not eating out really had an effect on us. I’ve always been one to LOVE eating out, I’d pretty much always choose that over eating in, even with my love of cooking. I think I liked the event of it, something different AND not having to do dishes. But Monday night we went out to dinner for the first time in weeks, and I found myself wishing we were back at home, eating something I’d cooked up and just enjoying time around our own dinner table, folding chairs and all. And the surprising thing is, when I shared with my husband what I’d been thinking, he said he’d felt the same way. I never would have guessed all we’d want to do after a month minus restaurants is to stay home, but I’m pleasantly surprised that that’s the case.